1) First, you get an idea. It can come from various places: Perhaps you're inspired by the mechanics of an existing game, or maybe you had an impressionistic or visceral reaction to a particularly good song. It's all clear to me now! you think. Best get to work - after all, no one is going to make your game for you. 2) You open your copy of Game Maker and imagine everything coming together. Your mind juggles around commands and variables as you try to create a puzzle worth solving. During a dreadfully boring high school math class or college lecture, you doodle some character art in your notes, which you later scan and make into a few sprites. Next, it's time to find some sound effects and maybe even a music track under Creative Commons. Things are coming together. The game will be finished in no time! 3) Then comes the final and most important step in this process: You lose hope and give up. Congratulations, you are now a bona fide indie game developer! This unfortunate pattern has only gained momentum over the past few years. For some, game design might be an authentic calling. They have a mind for ideas and simply cannot rest until one brainchild runs free. Others may have illusions of grandeur, looking at the success of recent titles like Braid and seeing indie classics like Cave Story and La-Mulana ported onto consoles. Either way, these poor souls are being lured into a deep sandpit from which practically everyone emerges emotionally drained, with entire weeks of time wasted and a plethora of regrets that may linger for years to come. 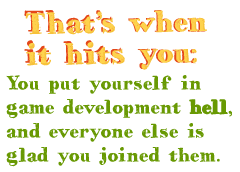 I'm talking, of course, about online indie game design forums.